Cadillac's advertising during this Sunday's Academy Awards telecast will feature a spot that borrows from President Theodore Roosevelt's famous "Man in the Arena" speech, but shows none of Cadillac's cars or SUVs. The spot's name, "Dare Greatly," is taken directly from a long speech Teddy Roosevelt delivered April 23, 1910, at the Sorbonne in Paris. "It is not the critic who counts; not the man who points out how the strong man stumbles, or where the doer of deeds could have done them better. The credit belongs to the man who is actually in the arena, whose face is marred by dust and sweat and blood; who strives valiantly; who errs, who comes short again and again, because there is no effort without error and shortcoming ... who at the worst, if he fails, at least fails while daring greatly, so that his place shall never be with those cold and timid souls who neither know victory nor defeat." The ad doesn't credit Roosevelt. The voice-over of this quote plays against a slow-motion montage of New York City street scenes scanning pedestrians, sprinkled with a few taxis and a bicycle locked to a parking meter or street sign and a view of a bridge. A 90-second version of the commercial that Cadillac posted will be divided Sunday into a 60-second and a 30-second ad. "This is the start of a redefining of Cadillac's core values," said spokesman David Caldwell. To build anticipation, Cadillac has posted a zen-like 5-minute blank white-screen YouTube video for the last week as it prepares redesigned versions of its cadillac.com and social media sites. 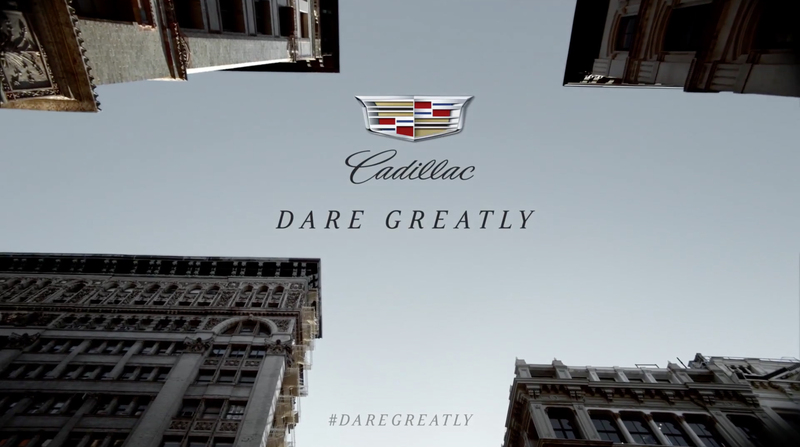 Caldwell said there will be two other Cadillac commercials, in addition to the "Dare Greatly" spots, that will appear during the awards presentation. At least one of them will feature a car. Initial online reaction to the Teddy Roosevelt ad was mixed. "Well played. Bold and yet humble in its message," Ryan Evneson posted in the YouTube comments section. Lauryan Flipsen was less impressed, posting, "Yeah, would be fantastic for Cadillac. Not one model shown." This marks one of the first Cadillac ads created by Publicis Worldwide, the agency to which Cadillac moved its creative account late last year from Detroit-based Lowe Campbell Ewald. Johan de Nysschen, who took over last September as Cadillac's president, decided to move its marketing operations from Detroit to New York. De Nysschen is intent on doubling the scope of Cadillac's product lineup and doubling its global sales by 2020, all while convincing well-heeled luxury carbuyers that Cadillac is the equal of Mercedes-Benz, BMW, Audi and Lexus. GM's board of directors recently approved a $12-billion product development budget for Cadillac. The next new model will be the new CT6 full sedan that de Nysschen will unveil this spring at the New York Auto Show. The plan calls for a new SRX in 2016, a smaller crossover in early 2017 and a crossover that is bigger than the SRX, but smaller than the full-size Escalade SUV. After that, Cadillac wants to offer a sedan that is smaller than the ATS, followed by a very large sedan, larger than CT6 by the end of 2020, de Nysschen said in January.